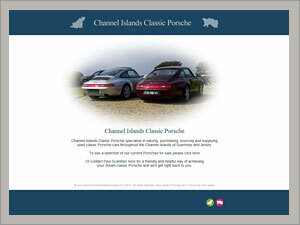 Channel Islands Classic Porsche | Porsches for sale. Web Design by Bazil. Channel Islands Classic Porsche specialise in valuing, purchasing, sourcing and supplying used classic Porsche cars throughout the Channel Islands of Guernsey and Jersey. View a selection of current Porsches for sale or contact their representative to see how to achieve your dream classic Porsche.